ProSurf Browser for iOS gives you a wide range of options. Some of these options are available at a browser level and some of them are available at a Website level. In this document we will walk through all the options available. We will also see how to setup a Device Profile so that ProSurf can be used as Kiosk Browser. We suggest you Get a Cup of Coffee, as ProSurf offers quite a few configuration parameters!! Make sure you have a valid MobiLock Dashboard account. 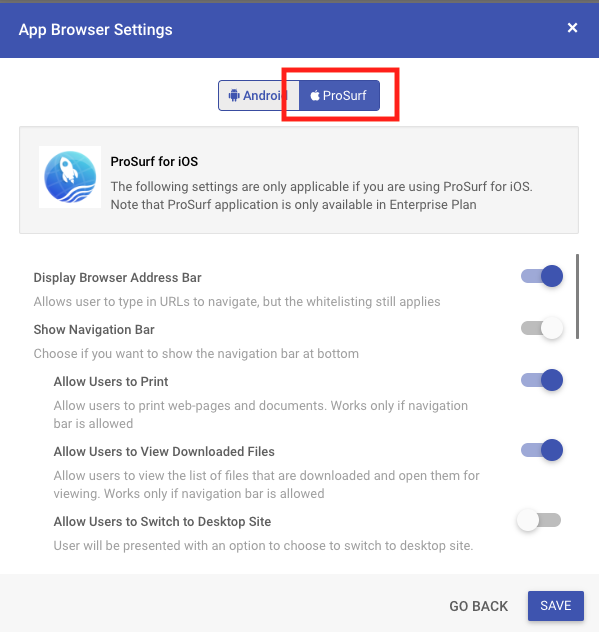 Make sure you have enabled ProSurf as described in our Enabling ProSurf guide. Click on Browser Settings button. In this dialog you will see various options. We have given the description of each option in the table below. Once you have configured the settings, click SAVE. If this option is enabled then the address bar is shown in the ProSurf app. If you do-not want your user's to manually enter URL addresses then disable this. this option, hides the navigation bar and the related options. The related options are Print, Downloads, Request Desktop Site, Forward/Back navigation. If this option is enabled, then users can print the current webpage by using the Share option menu in Navigation bar. If this option is enabled then user's will be able to download and view the downloaded files. using the Share option menu in Navigation bar. Enable this option if you want the user's to navigate back/forward in the website. Enable this option if you want the whitelisted websites to open new tab windows. Enable this option if you want to enforce In-Private or Incognito browsing by default. Disable this option if you do not want users to interact with your website. the notification bar at any time. Automatically lock down ProSurf app in single app mode when the application is launched. By Enabling this users can tap 5 times continuously on the screen to exit single app mode. Use this option to Show/Hide settings option on the ProSurf home screen. Website Name: The name for the website. This is used to refer to this website within the Dashboard and on the client this is the name used for the Bookmark/Shortcut. Website URL: The URL of the website. Visible on HomeScreen: Choose if a bookmark for this website should be placed on ProSurf home screen. Upload an Icon: You can upload an icon for your website. This will be used by ProSurf when it shows the bookmark on home screen. If no icon is given then ProSurf tries to load the default icon for the webpage. This is also the icon that is used when this website is used as a web-clip. Safari Settings: These settings only apply when this shortcut is used with Safari. To learn more on how they work please refer to this document. Enable this setting if you want to whitelist the complete domain rather than just the URL. 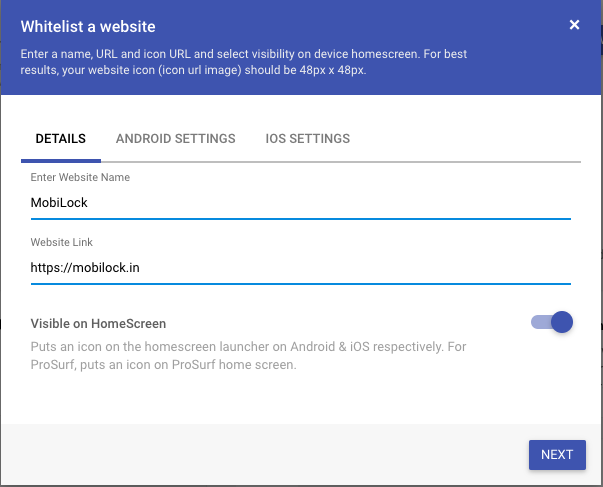 For example if you want to whitelist all the pages and sub-domains in the domain mobilock, instead of just mobilock.in then enable this setting. Enable this setting if you want the end-users to pinch and zoom in your website. Enable this setting if you want the videos in the whitelisted website to be auto-played. If you want your website to automatically refresh after every X seconds then set the value using this setting. Enable this option if you want the cache to be cleared every time the page auto-refreshes.This depends upon the Auto-Refresh value you have set. Enable this option to load the website in Desktop mode by default. User's can switchbetween modes if the setting is enabled in Browser Settings. Enable this option if you want the page to start loading from the root URLevery time the shortcut is clicked. This means the webpage will be closed when user minimizes it. Click SAVE once you are done and the newly added whitelist website should appear in the list of websites. Navigate to Device Management > Device Profiles section. Create a new iOS Device Profile or edit an existing one. In the Select Apps section, enable the ProSurf application. In the Whitelist Websites section, enable all the websites that you want in this device profile. Use ProSurf as a normal Browser: No special steps are required. Please proceed to next step. NOTE: Disabling Safari is an optional step. If Safari is also enabled then users might end up seeing two browsers which may cause confusion. Also the web-filtering logic might conflict between the two browser applications. Click on UPDATE PROFILE to save the profile. Once the Profile is saved, a push will be sent to the devices to install ProSurf application, if not already installed. Once ProSurf application is installed and launched on device, it will sync the settings from Dashboard. NOTE: ProSurf application can also be installed from Enterprise > My Apps > MobiLock Apps section. If you are using a VPP subscription, then you can purchase licenses for ProSurf application so that it is installed silently. Once you have set up the Dashboard and pushed the ProSurf application from Dashboard, it will be installed on the devices. The following steps guides you through the flow on devices. Wait for the application to be installed on device. Once installed you would see the ProSurf app icon on home screen. Click on ProSurf app icon. You will be asked for the Notification permission. Please click on Allow. Now the application will register itself to MobiLock dashboard automatically. Once the registration is done, ProSurf home screen will be shown with the whitelisted websites and other settings.